This is a big party tent for wedding party for about 500 people. It is with clear windows around and luxury roof lining inside. This 500 people tent is one of wedding party tents for sale in Nigeria. 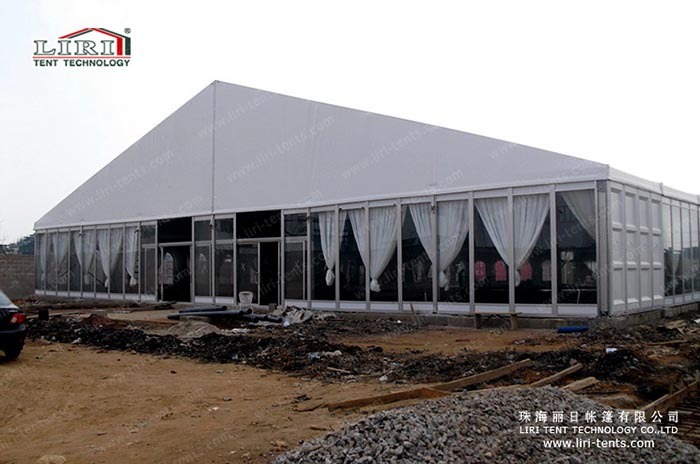 The clear span of the party tents sale Nigeria range from 5m to 60m, the length is unlimited. This modular tent system can be increased and decreased in bay distance of 5m. However, we also supply custom party tents based on your needs. The main profile size is 204X120X4 mm. The frame of the tent is made of hard pressed aluminum alloy 6061/T6. The PVC roof cover and sidewalls are total waterproof and flame retardant. Nigeria is one of our large markets in the world and Liri Tent is the largest party tents supplier in Nigeria. Our party tents sales in Lagos, Abuja, Port Harcourt, Owerri, Minna, Ilorin, etc. Our Weddings Party Tents in Nigeria usually apply for event venue, wedding reception, church hall and exhibition center. If you want to know more party tents sale Nigeria and more party tents, just SEND your detailed product inquiry below. We will get back to you as soon as possible.